It’s cold out there, and you are sitting in your house with a great gas heating system. Ideally, you want your gas heating system to keep you cozy for a decade or more. This result can only be made possible with care and maintenance. With a few steps, you can avoid a significant breakdown and keep your heating system running efficiently. First things first! Safety measures must be on the top of the list. Before getting into the furnace cleaning, you have to take some steps to avoid any mishap. There will be a power switch on the furnace. Turn that off to cut the power and to make the heater safe for maintenance work. Most people find it difficult to find the filter because every gas heating system has a different design so the filter can be anywhere within the system. Usually, it’s in the furnace itself, but some are in the vents. You either need to look in the owner’s manual (hard copy or online) or if you like a challenge, just look in the furnace or vents in the walls or ceiling. Once you’ve located the filter all, you have to do take out the filter and note its dimensions. You will need those dimensions when purchasing a new one. It is recommended that you replace the old filter after a specified time (mentioned below). But if you’re not in a mood for replacing it, then just cleaning will do too. Depending on the type of filter this means vacuuming the filter or running it under water. It depends on the type of the filter your furnace uses. If you have a polyester or pleated filter, then you should change it every three months. One month for a fiberglass filter. However, if you have an indoor pet or someone who smokes, you should change your filters every month. Now that you have a new or cleaned filter at hand your job is almost done, all you have to do is to reverse the entire process. Place the clean filter back in its place and tighten up all the screws if there are any. Close the furnace or vent, turn on the power again, and you’re done! This straightforward process will keep your furnace running efficiently and maintain excellent air quality throughout your home. 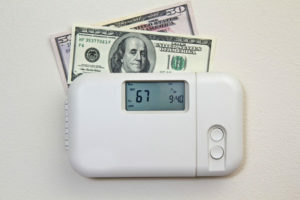 For help maintaining a gas heating system, contact Good Deals Heating and Cooling at 215-947-1166.